This spice mixture is enough for one 1-2 lb fresh whole tilapia. Add all the dry spices into a bowl and stir well with a fork to combine. Add as little olive oil as you can to get a paste. Use the paste to coat the inside of the fish then stuff the inside of the tilapia with alternating slices of lemon, grapefruit and orange. Then you can spread the paste all over the fish as well as in the grooves that you will cut on the outside of the fish. (I slices groves in both sides of the fish and made sure to get the paste well in there. Grill on medium heat until both sides are fairly opaque and firm to the touch. 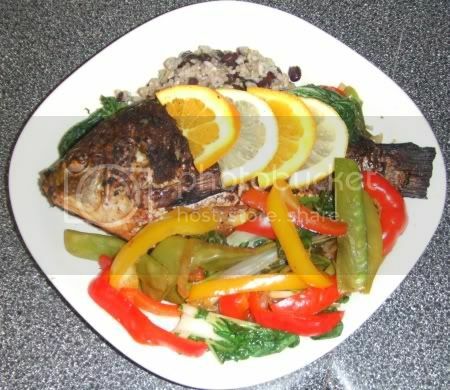 Serve with a brown rice and black bean vegetable medley and some black olive or rosemary biscuits. Pics to follow after dinner. OH, my!! that looks delicious!